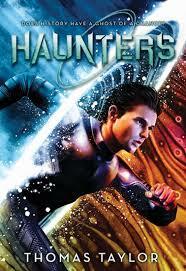 Haunters, by Thomas Taylor (Chicken House, 2013 in the US, 2012 in the UK), is a fine example of a particular type of time travel book--the exciting, sci fi-ish adventure packed type of story in which a young protagonists must race back in time to keep disaster from happening. David is a modern kid, with a difference--he's been having extraordinary dreams about a strange boy named Eddie. When one of these dreams turns into a full blown nightmare, with Eddie trapped inside a burning building, David's life gets even stranger. David saves Eddie from burning alive in reality as well as in his dream...but Eddie's life is still in danger, even though he's been dead for a few years. Eddie is a child of WW II London, and he's destined to figure out how kids can travel in time through their dreams, as David has been doing. He's going to set up a sci-fi training headquarters for his Dreamwalkers under the Swiss Alps. But not all the dreaming time travellers are the benevolent shepherds of history that Eddie had planned. A rouge faction has sprung up, determined to sabotage the past, and Eddie is their target. Once things get going, and we are past the part where David is introduced to the society of Dreamwalkers, things get going with a vengeance. It's a wild ride through time, with plenty of nail-biting tension to keep the pages turning. It's not a subtle, character driven book of great emotional resonance, but it does deliver just enough in terms of interesting personalities to add a bit of depth to the adventure. If you have a young reader on hand whose eating up the Mutiny in Time series, this is a perfect book to give them. Good for older middle grade kids (11-12). This sounds really fun, like an MG Terminator.